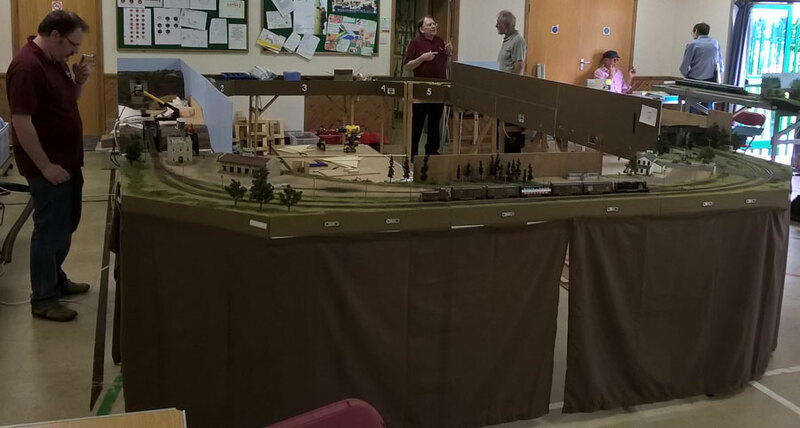 Every July the Alton Model Railway Group holds an open day, at the same time as the vintage bus rally in Anstey Park in Alton where we hold our meetings. 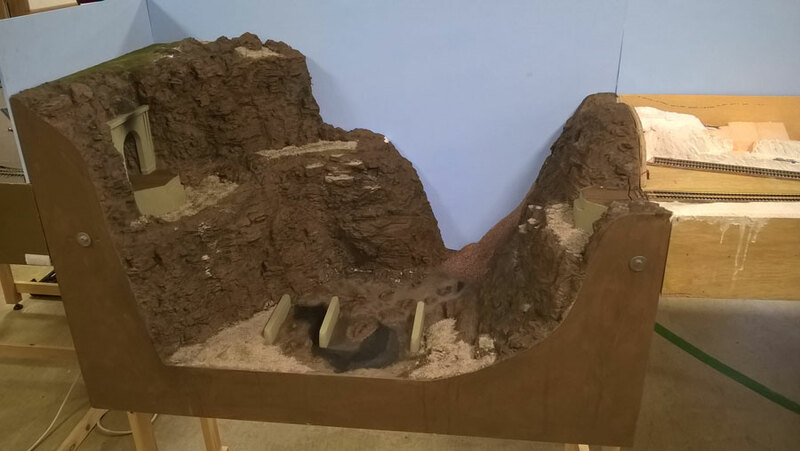 The American section took advantage of the day this year to set up the full Pine Bluffs & Red Dot Mine for only the second time (the first was to check everything lined up and fit together). 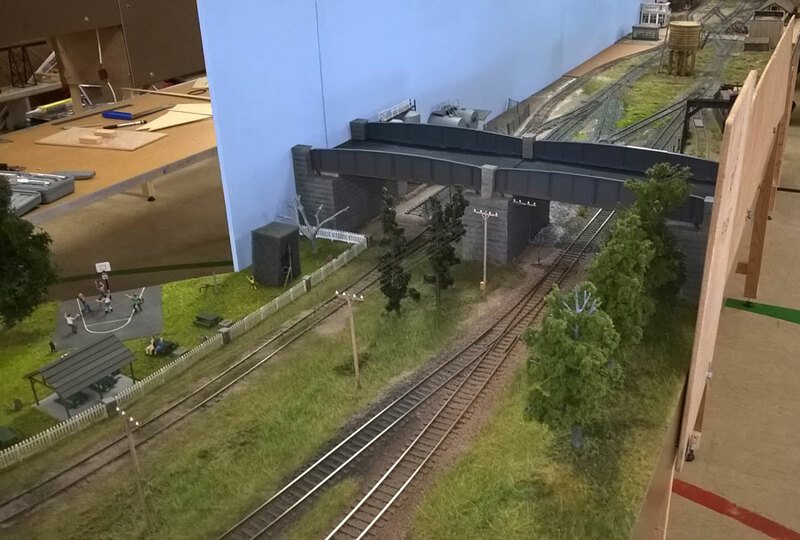 We had the lofty aim of running a train all the way around the layout, as well as plenty of jobs to do that needed everything to be joined together. To complete the track loop to run a train, we had to fit not one but two bridges in order to complete the track loop. Unfortunately in the week before the day, we had significant problems with the Woodland Scenics Realistic Water – not only did it not sit level (which was our fault), leaving a weird ridge in it that didn’t disappear with additional pouring, but in places stayed a noticeable blue colour, ruining the effect of the river bottom. As you can see from the picture, we took the decision to remove it, which pealed up surprising well, but that meant the bridge could not be set in, so the track loop could not be completed. We did however set in the bridge over the canyon. We did get a host of other stuff done during the day, including fitting and fettling the new backscenes, testing out one of the new lighting poles, checking the new curtains for the front of the layout, agreeing placement of buildings going back onto the Depot boards, which have now been fitted with lighting (and placing the new building – more on that in a future post), and wiring of the track that could be laid on the Red Dot Mine side. Overall, not as successful day as we had hoped, but still a lot done.